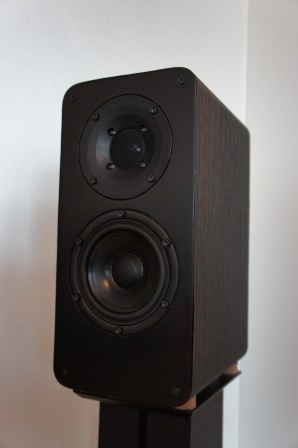 Prestigious Two – M1 DXT is a small sized 2-way stand-mount bass-reflex loudspeaker. It’s ideal for small to medium sized listening room. The tweeter can be fine-tuned to several different levels according to personal preferences and taste. Prestigious Two – M1 DXT uses two driver units from SEAS. The CA12RCY with a hand coated paper cone 4.5” mid-woofer from the Seas Prestige series and the 27TBCD/GB-DXT with an aluminium/magnesium alloy dome tweeter with a DXT lens. 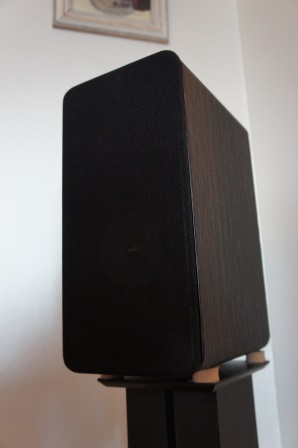 The mid-woofer have an extended and smooth frequency response without sharp cone break-ups. 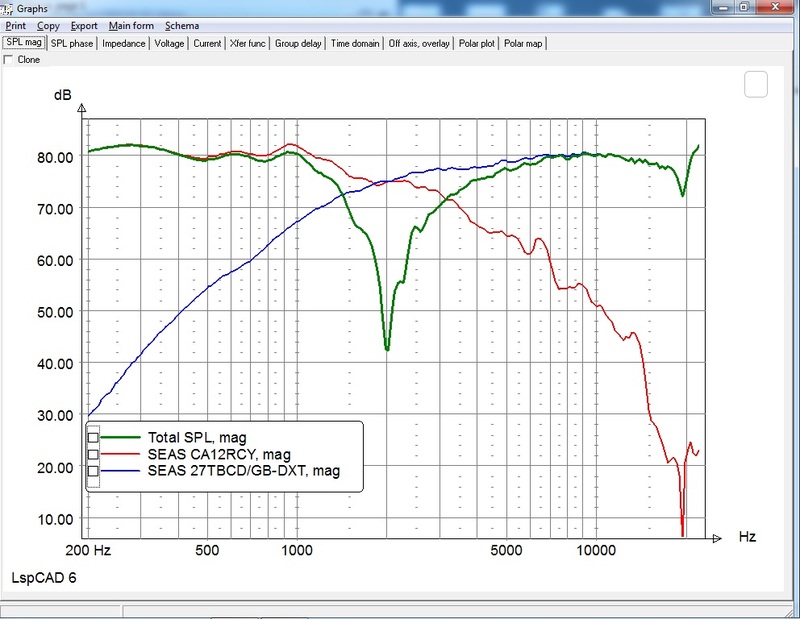 The DXT technology solves several well-known issues regarding; directivity control, off-axis response, integration with midrange units and baffle diffraction. Prestigious Two – M1 DXT uses a 4,7 liter enclosure. The enclosure is made of 19mm MDF and the internal cabinet walls are taped with bitumen pads in order to reduce resonances. The enclosure is lightly filled with sheep wool. 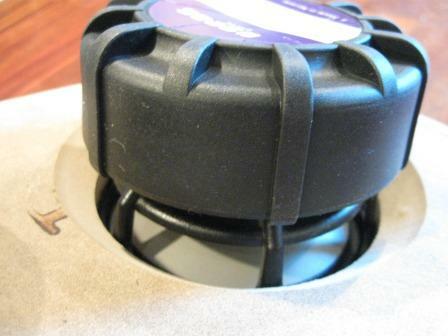 All drivers are flush mount and in order to let the mid-woofer “breathe” properly, don’t forget to chamfer the baffle for the mid-woofer. Minimum impedance of 7,2 Ohm @ 260Hz. The Prestigious – M1 DXT uses an acoustical second-order Linkwitz-Riley (LR2) filter topology. The most common way to address the driver units relative acoustic center off-set is to use asymmetrical cross-over slopes, but as in this design when using LR2 filter topologies it’s not feasible. Other choices for dealing with the driver units relative acoustic center off-set is to use a slanted or stepped baffle as well as the use of an electrical circuit to time delay the tweeter in order to adjust the acoustical center off-set. Thanks to the depth of the DXT lens, the acoustical center off-set is perfectly aligned without the need for such techniques. The mid-woofer cross-over filter section is an electrical first-order and is very simple and consists only of a large coil (L1) and (C3+R3) that shapes the cross-over slope to a LR2 roll-off with a targeted 2kHz cross-over point. The inductor (L1) also tunes the “Baffle Step Compensation” (BSC). 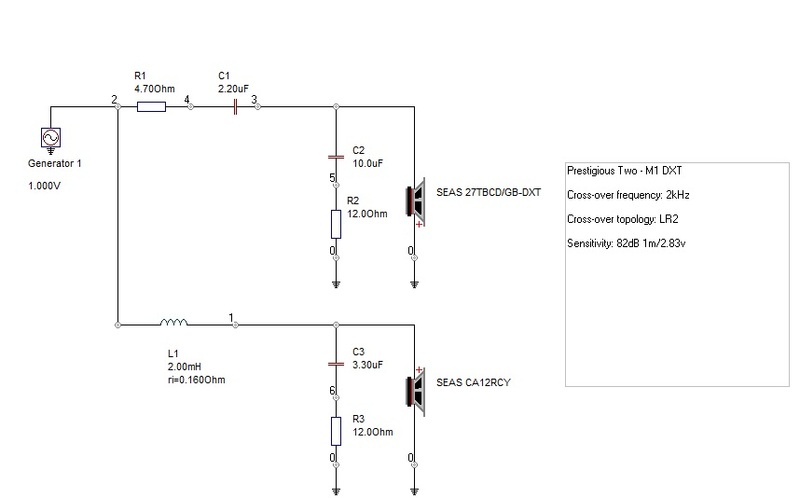 The tweeter cross-over filter section consists of a single tweeter series resistor (R1) and (C2+R2) together with a first-order electrical filter (C1) that shapes the cross-over slope to a LR2 roll-off with a targeted 2kHz cross-over point. Note! The tweeter should be connected with reversed polarity as shown in the cross-over schematics. 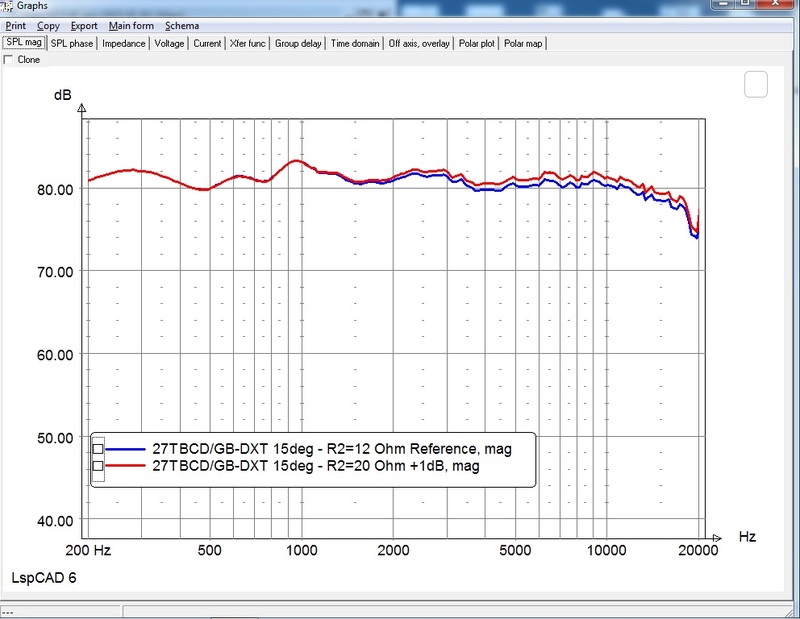 The (C2+R2) shapes the level and upper frequency response of the tweeter. The value of (R2) can be changed to tailor the tweeter’s level to personal preferences. 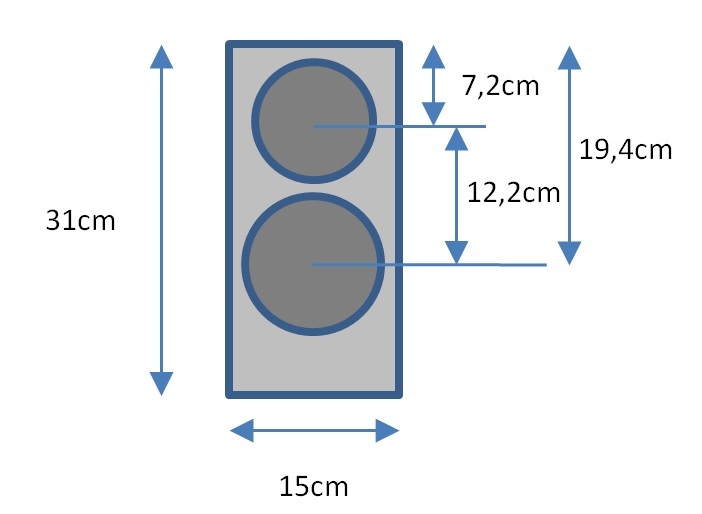 If nothing else is noted in the comments, the following frequency measurements of the finished loudspeaker are made at a 2m distance 42mm below tweeter height. My tweeter samples have slightly different frequency responses above 15kHz. 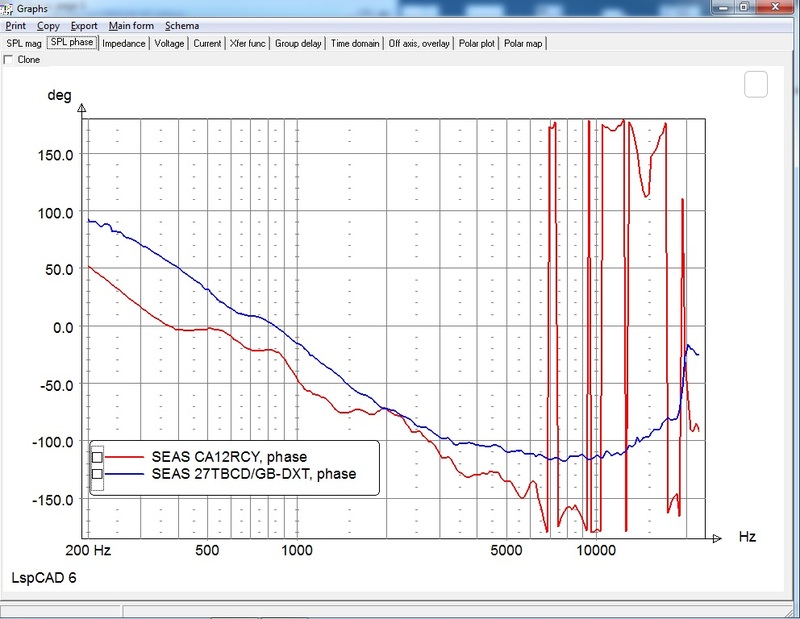 On-axis, the frequency response is a bit “hot” between 6-9kHz, but is smooth around the 15deg off-axis response and beond. The distortion measurements are done in near-field and the amplifier output level was adjusted for so that the fundamental is 90dB at 1m. This setting simulates medium-high level. 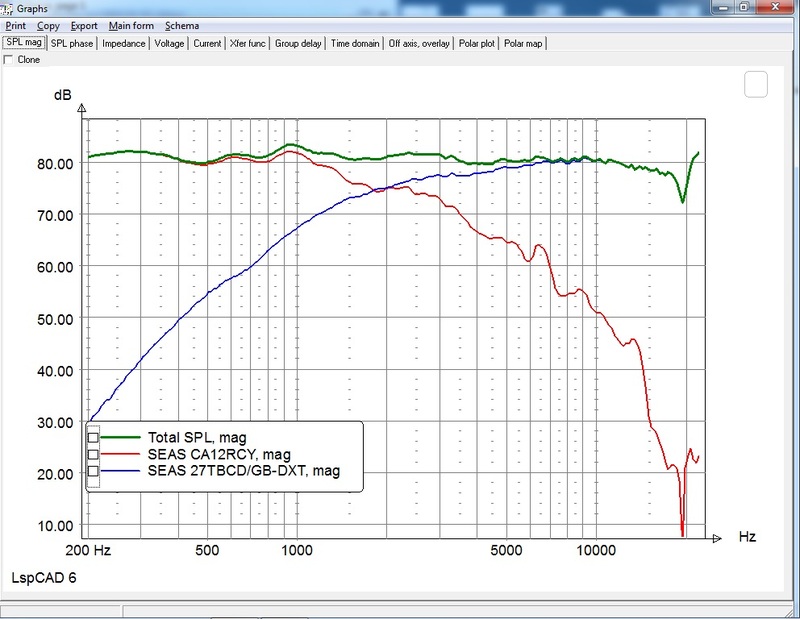 The Prestigious – M1 DXT doesn’t have the same low distortion profile as its sibling Excellence Two – M1 DXT, but the third-order distortion profile is <0.3% below 2kHz, which is good for such a small loudspeaker. 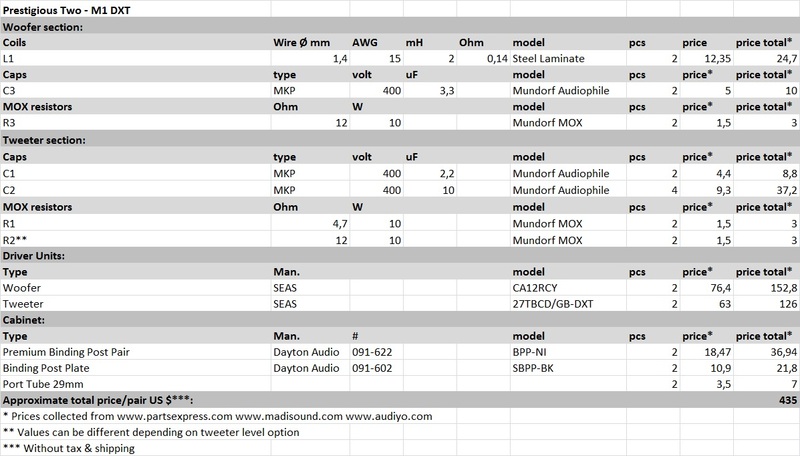 The suggested components would cost about 435 US$ for a pair, which is about 280US$ less compared its sibling Excellence Two – M1 DXT, but the cost can be reduced by choosing less expensive cross-over components. The Prestigious – M1 DXT shares many of the Excellence Two – M1 DXT qualities, but doesn’t have the same powerful and clean bass as the Excellence Two – M1 DXT and it might need the support of a sub-woofer in larger rooms. The coated paper cone have a slightly higher second-order distortion profile which gives a bit more lively mid-range presentation compared to the Excellence Two – M1 DXT. 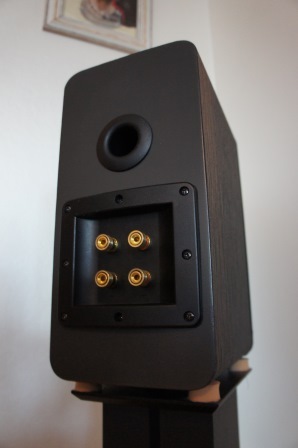 The Prestigious – M1 DXT loudspeaker has a generous sound stage with a nice width and height. Thanks to the tweeters DXT lens the sweet spot exceptionally large. With a sensitivity of 82dB 2.83v/1m, this loudspeaker does need some power to come alive and I recommend an amplifier of at least 50W or more. No or little toe-in. Listening height at tweeter height.